It’s a bright, guilty world. I waited far too long to watch this- it’s the only other Rita Hayworth film I had in my instant queue and I kept getting distracted by other things. 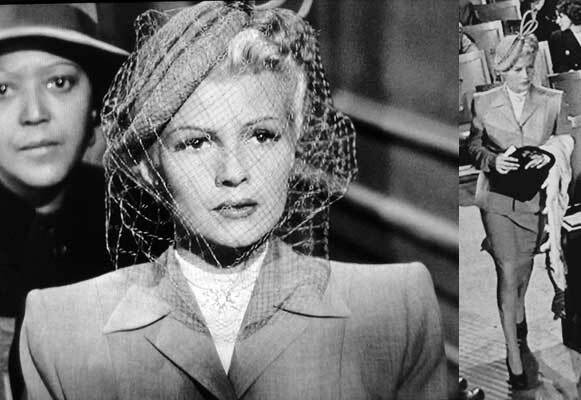 I must say, it is nothing what I expected- this is true film noir, and Rita has short, blond hair! Referring to this short hair later in life, she said, “I don’t see the point of following a fashion if it is not becoming.” (She always has longer hair in her other films.) What a delightful sentiment that we should all follow! The Lady from Shanghai also features Orson Welles (Rita’s then-husband) as Michael O’Hara, a sober but ill-fated Irish sailor who is shanghaied into service on Rita’s husband’s yacht (in real life owned by Errol Flynn, who pops up in the background occasionally). Welles is also the producer and director. As the narrator, he philosophizes constantly, giving us such gems as the opening quote, “﻿Everybody is somebody’s fool” and “﻿I’ve always found it very… sanitary to be broke”. If he’s that chipper while sober, I think I’d hate to meet him drunk. But for now – let’s get to the clothes. Everything about this dress is wonderful- sweetheart neckline, drapey, caped sleeves, nice fit, and 4 belt loops front and slightly off-center. The polka dot fabric is ideal for spring as well. I’m pretty excited to tackle this as a how-to. Every yacht should come with a Rita Hayworth costume kit. As a costume and an authentic wear-it-in-the-40s outfit, I adore this pea coat, hat, and brooch combo. In the real world, anyone trying to pull this off would probably look too much like a Madonna wannabe, which is a bit tragic. The fit and length of the coat, just grazing the hem of her white shorts, is dreamy. In the 4th image, I need to be honest and say that I would never, ever sport these high-waisted shorts. However, I do love the button detailing up the front thigh. I included the last picture just so you all would envy Rita as much as I do- she dives into the ocean and comes out looking like that. I dive into the ocean and I come out looking like a less-than-glowing drowned poodle. While aboard the pleasure cruise, Bannister (Hayworth’s husband) indulges everyone in a ridiculous picnic- it requires canoes, cross-swamp treks, and a native village to put this fiesta together- this is made all the more ridiculous by the fact that Bannister requires two canes to walk and bears a strong resemblance to Montgomery Burns. Apparently, the only way to enjoy this picnic is to drink from the largest flask ever manufactured while acting like utterly pompous asses. No fashion review here (other than that I would turn this into a purse if I could)- I just wanted to share the moment. After the cruise, where Rita falls in love with Michael (Welles), they meet up in a series of bad idea dates- below is what she wears to the aquarium with him. What to wear when visiting octopi. The silhouette here is actually very modern- designers constently shift volume around on the female body, and this big-on-top, slim-on-bottom look should be pretty flattering for most women. What’s not to love about accentuating the positive and sucking in the negative? You can see here that I was consistently foiled in this movie while I tried to get good full-body shots of Rita’s clothes- I was always hampered by her purse, jacket, someone’s head, or some other random thing. In addition to her silhouette, I love the 3/4-length sleeves of her coat which expose her cuffs- this is a beautiful, classic look. Black, for the night of the multiple murders. This is what Rita’s wearing the night the murders go down- and it’s actually a pretty good representation of Rita’s character- sedate and a bit predictable on top at the surface, and increasingly baffling and more complex the further down you go. The bodice is high-necked (almost turtlenecked) drapey dolman-sleeve that buttons up the back (LOVE!) and cinches at the true waist. From there, we have a drop waist that goes into an ankle-length pleated skirt. It’s completely possible that this is acutally a blouse and skirt combo, and not a dress, but it’s hard to tell. The bottom 12″ or so of the skirt has these shiny square things all over it, and I can’t figure out what they are. I can’t tell you how many times I paused and rewound these scenes trying to see them clearer- this is about the best I could do. Meeting at the courthouse for a defense (or prosecution?) strategy meeting. Michael becomes the patsy for the various murders, and Bannister is a decrepit but infamous criminal defense lawyer. 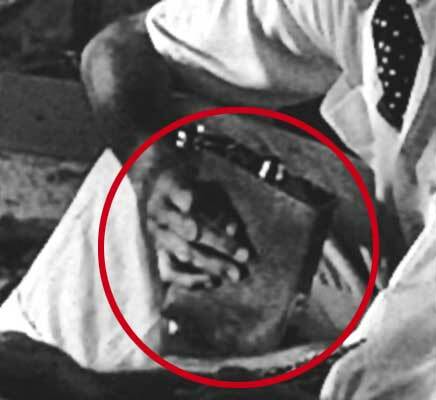 He signs on to defend Michael, despite knowing about Hayworth’s romance with the not-so-drunk Irishman. Hayworth meets her husband at the courthouse to discuss the pending trial wearing this. I believe the coat is a sheared-fur, with great texture. Her necklace is divine! 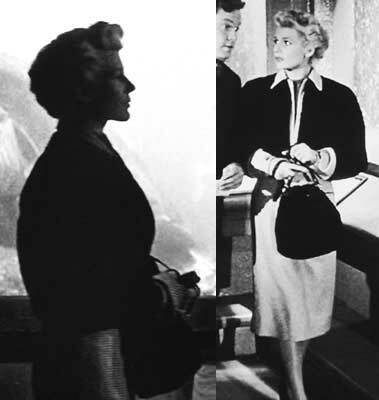 The director (Welles) wanted to use this scene to illustrate the building tension between husband and wife, and so he slowly zooms in on them as they speak, finally ending up with just Rita in the frame. This zoom is excruciatingly slow- like watching paint dry slow. All I wanted was a picture of that necklace, and I think it took 20 minutes to get there! By the end of it I was laughing so hard at the ridiculousness of the zoom I’m shocked I was able to get a somewhat steady shot. I swear to tell the truth, the whole truth, and nothing but. Finally, Hayworth gets called as a witness. Will she speak for the defense or prosecution? Who really cares? She looks fabulous. Her light-colored suit is perfection with its wide notched collar, straight shoulders, jaunty veiled hat, and fur stole. Incidentally, I’m not really a fur fan, but I don’t have a moral soapbox to climb because I do love leather. I’m just pretty sure I couldn’t wear anything that still has discernible body parts attached, like feet, tails, heads, etc. In the Crazy House in Chinatown.